Fall is here and we’ve got pumpkins on the brain. We also have wine on the brain…constantly. So why not combine the two? Here are a few fun ideas for incorporating pumpkins into your next wine party. It’s genius really. 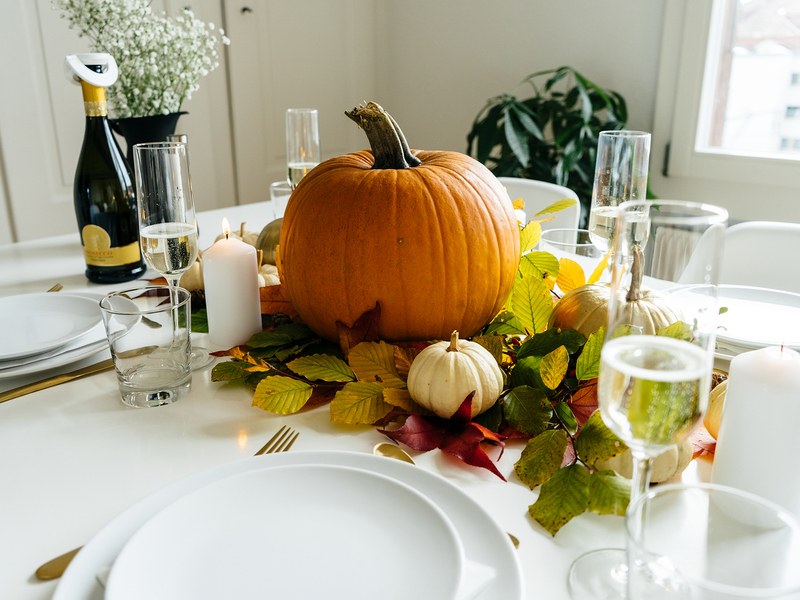 And such a fun way to decorate for a festive fall gathering. Grab a large pumpkin and cut off the top third with a serrated knife. If your pumpkin is longer than it is wide, you could also lay it on its side and cut a hole large enough to fit a few bottles. Just make sure it’s stable, as we don’t want it rolling away! From there, dig out the seeds and pulp. Ideally, you’d have a glass or plastic bowl that fits perfectly inside the hole. If not, line it with some plastic to avoid water-logging your gourd. Right before your guests arrive, fill the pumpkin with ice and place inside as many pre-chilled bottles as possible. If you want to go all out, you could also grab some paint and decorate the pumpkin bowl, or spray paint it entirely. And there you have it. 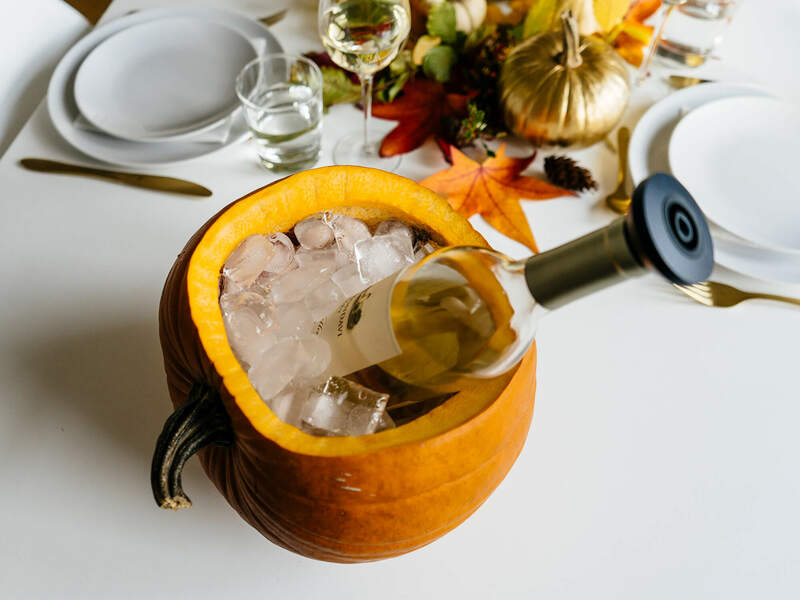 Bippity Boppity Boo, something better than a pumpkin carriage: A pumpkin wine cooler! A pumpkin that serves wine! Here’s how to transform boxed wine into an excellent conversation piece at your next party. Cut the top off your pumpkin and scrape out the seeds and pulp. Punch out the boxed wine’s circular tap cover and use it as a stencil near the pumpkin’s base. At this point, if you feel like carving out a design or decorating your pumpkin, go for it. Then remove the bag of wine from the box and place it in the pumpkin, poking the spout through the perfect hole you carved earlier. You may have to slightly adjust the hole to get the spout through. If you carved out a design, use a battery-powered candle to light it up. Keep in mind you don’t want anything that will heat up the wine too much. Put the top back on and viola, a pumpkin wine dispenser! Set it at the edge of a counter or on top of something to make room for a memorable pour. Your pumpkin doesn’t have to serve the wine to be a part of your next wine party. They work as great decor for creating autumn vibes. Here you can get as creative or simple as you’d like, carving out intricate designs or placing it on the table as is. If you’re celebrating Halloween, you could carve out or paint on the phrases “Happy Hallowine!” or “More Boos Please!” Have fun with it! Get it? A cork pumpkin! If you’re a cork saver, this is the perfect idea for some fall decor that’s all about wine. Create a pumpkin by gluing together a base of four corks. 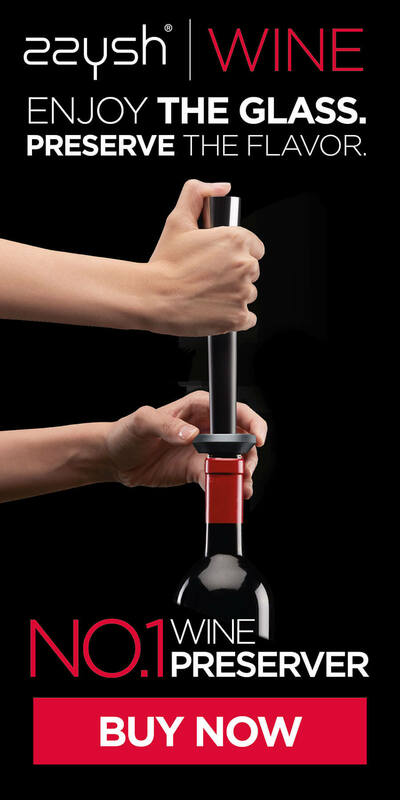 Then add a row of five, then six, then five, then four, and finish it off with half of a cork on top as the stem. You could paint each cork orange or leave a few wine-stained in the mix depending on your taste. Find some fake leaves or make some out of green felt for an extra touch. Tie some jute string around the base of the cork stem and have friends marveling at such a fun idea. Parmesan Pumpkin Fritters. These are amazing alongside a glass of Prosecco! Roasted Pumpkin Seeds. Save those seeds from your pumpkins and create a delicious, crunchy snack to pair with an oaked Chardonnay. Pumpkin Hummus with Fresh Sage. Try this lovely dip on pita chips with a zingy Grüner Veltliner. Pumpkin Basil Pinwheels. These fluffy divine bites would go great with a sparkling Brut or buttery Chardonnay. And possibly saving the best for last: Pumpkin Pecan Baked Brie. This gooey goodness will be gone before you know it. Sparkling wine is a sure pair, but an off-dry Riesling could be interesting as well.